From my years of being a faithful Phish fan, I attained a classic Pollock baseball tee shirt from their run in Vegas in 1998. This IS my favorite Phish shirt. Red sleaves. Pollock pop artwork in dark red, blue, and gray of the Vegas strip. Well worn. Beloved. Somehow. Somewhere. Someone managed to swipe my shirt in the past few weeks. Happy hunting! Hope you find it. Know anybody thats a shirt collector? 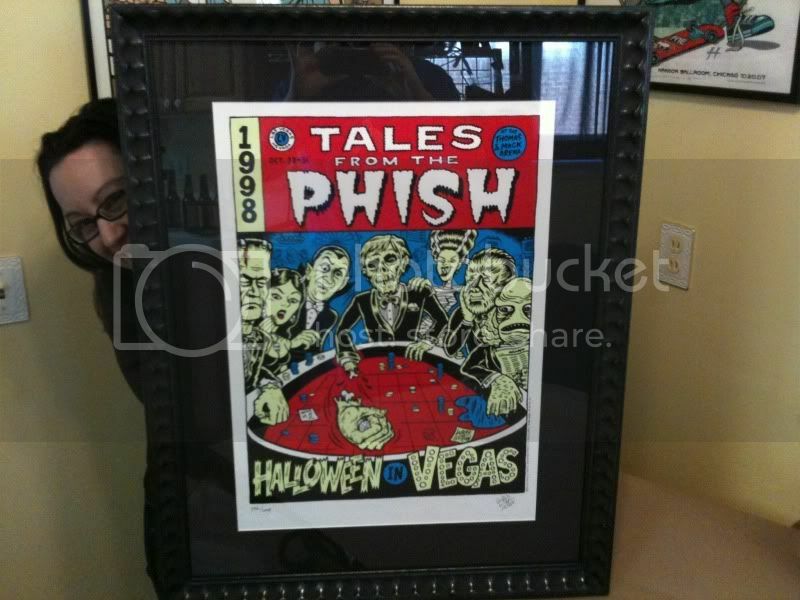 not what you are looking for but if you search "phish vegas 98 shirt" on ebay there's the tales from the phish one with the guy rolling dice and his hand falling off. Pollock did not do a shirt for Vegas 98. ^ I realized later that its not Pollock. It's a Ward Sutton. Nevertheless, I still want my shirt . . .
^ Nice. We have the poster!